Combat soldiers from the IDF's Paratroopers Brigade received an unusual allocation this week and fired a Spike-MR missile during a training exercise held in preparation of the troops' scheduled operational activity along the northern border. The Spike-MR rare launch was documented by the IDF and is quite the sight. The missile is a portable "fire-and-forget" guided missile, and it is one of the army's most advanced anti-tank and anti-personnel projectiles. In wake of its high price – a few hundred thousand shekels per unit – it is rarely used in training, fired only once a year. As an alternative, combat soldiers usually train on an ersatz version. "There are Spike fighters who have never fired a real one throughout there entire service," a senior officer in the Israeli Ground Forces said. The Paratroopers Brigade explained that the decision to allow the forces to train with live missiles stemmed from the unique operational needs of paratroopers working along the Lebanese border, but also from a desire to preserve the operational capabilities required for everyday security work along the border. The operational usage of such an advanced missile – manufactured by Rafael Advanced Defense Systems – is required during ambushes and routine security activity. Just this year a Golani Brigade scouting unit fired a Spike-MR at a Syrian outpost which opened fire in Israel's direction. The Paratrooper's training took place in the Golan Heights and used a target located a number of kilometers away from the soldiers. Upon inspection, despite the distance, the target sustained a devastating direct hit. The Spike-MR, part of the Spike class of missiles, allows soldiers to control the missile after it has been launched with the help of a remote control. The missile has an accuracy of less than a meter and can accurately target specific marks, including windows, terrorist cells, armored cars or military pillboxes. 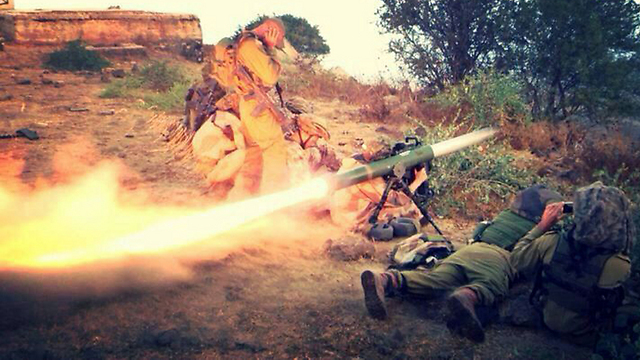 The Spike's success within the IDF began immediately with its introduction in the army arsenal in the 1990s. It has recently undergone a number of upgrades which have substantially reduced its size while increasing its accuracy, and have led to its sale to foreign armies including the Netherlands, Poland and Spain. "The height of the Spike's usage was reached during training, which began with a brigade parachuting, then a 30-40km operational march, and full live fire exercises which included cooperation with artillery forces, tanks, the engineering corps and drones," said Lieutenant-Colonel Meir Almalm, deputy commander of the brigade. See all talkbacks "Watch: Paratroopers fire advanced Spike missile"